Search Results for "horse competition"
LJUBLJANA, SLOVENIA - MARCH 2014: Slow Motion Native American Girl Riding Spiritual Horse. Horse Riding Masquerade Competition in Big Riding Hall. LJUBLJANA, SLOVENIA - MARCH 2014: Slow Motion Girl Riding Dark Horse In Hall. Horse Riding Masquerade Competition in Big Riding Hall. LJUBLJANA, SLOVENIA - MARCH 2014: Cowgirl and Native American Masquerade Costumes on Horse. Horse Riding Masquerade Competition in Big Riding Hall. LJUBLJANA, SLOVENIA - MARCH 2014: Horse Masquerade Riding in Swimsuit. Horse Riding Masquerade Competition in Big Riding Hall. LJUBLJANA, SLOVENIA - MARCH 2014: Girl and Horse in Masquerade Costume Receiving Reward. Horse Riding Masquerade Competition in Big Riding Hall. LJUBLJANA, SLOVENIA - MARCH 2014: Slow Motion Walking Horses in Masquerade Costumes. Horse Riding Masquerade Competition in Big Riding Hall. LJUBLJANA, SLOVENIA - MARCH 2014: Slow Motion Horse Riding With Swimsuit Equipment. Horse Riding Masquerade Competition in Big Riding Hall. LJUBLJANA, SLOVENIA - MARCH 2014: Slow Motion Cowgirl Galloping Horse. 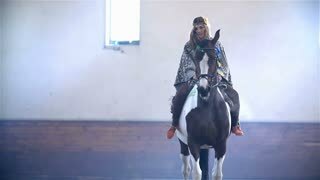 Horse Riding Masquerade Competition in Big Riding Hall. 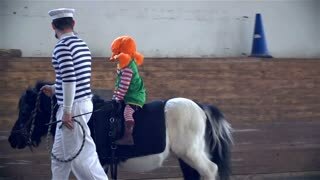 LJUBLJANA, SLOVENIA - MARCH 2014: Young Pippi Longstocking With Dad Riding Horse. Horse Riding Masquerade Competition in Big Riding Hall. LJUBLJANA, SLOVENIA - MARCH 2014: Slow Motion Bloody Princess Riding White Horse. 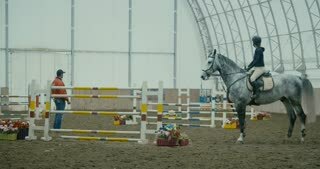 Horse Riding Masquerade Competition in Big Riding Hall. Hooves of walking horses on the sand. Legs of leading horses walking at the farm. Horses hooves in the motion. Dressage competition concept. Legs of dark horse walking on the sand. Horses hooves walking at the farm. Dressage competition concept. Sporty female jockey practice jumping. 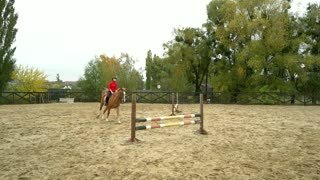 Slow motion young woman rider on bay horse jumping over obstale at equestrian sport competition. CLOSE UP: Focused young woman preparing her stunning horse for competition. CLOSE UP: Focused young woman fastening girth on her horse before competition. CLOSE UP: Happy woman petting her beautiful horse before a dressage competition. 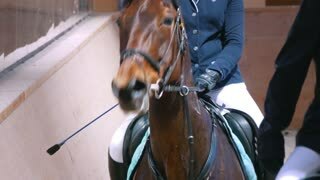 CLOSE UP: Smiling girl saddling up her horse before a dressage competition. Horse pulling competition at local county fair with draft horses dragging a heavy ground sled on a long run. Huge and strong horses in competition. 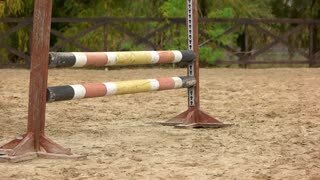 Horses must drag several thousand and up to ten thousand pounds at least 27 feet to qualify. Horse Draft animal pulling competition at local county fair with draft horses dragging a heavy sled on a long run. Huge and strong horses in competition. Horses must drag several thousand and up to ten thousand pounds at least 27 feet. Virginia girls ready for horse jumping competition 4K. 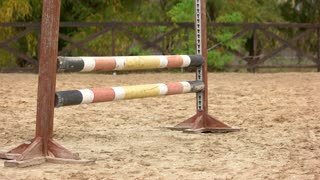 Young competitors perform horse jumping in competition. Parents and friends encourage and watch. Scores and trophies given to best winner. 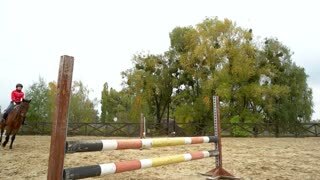 English riding equestrian events.